Drug delivery mechanisms using aerosols are an integral part of the treatment of respiratory disorders (eg, asthma, obstructive lung disorders, cystic fibrosis, pulmonary arterial hypertension,  infectious pulmonary disease). With the advent of novel macromolecular medications, the horizon of aerosol drug delivery is expanding to include nonrespiratory conditions (eg, diabetes, analgesia, thyroid disorders, genetic disease). The canister is housed in a plastic sleeve that has a mouthpiece for drug delivery. The pharmacological agent in a suspension formulation results in a 10% respirable fraction; an agent in a dilute solution formulation with a volatile propellant blend may result in up to 40% respirable fraction. The surfactant stabilizes the suspension by preventing caking. Various MDIs and an MDI diagram are shown in the images below. 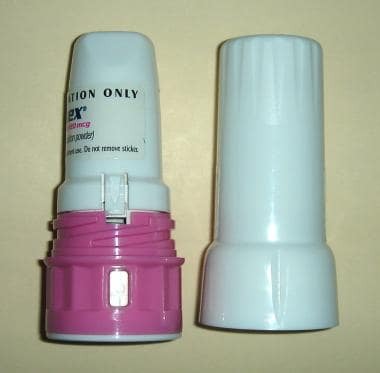 Metered dose inhaler (MDI) with dose counter. 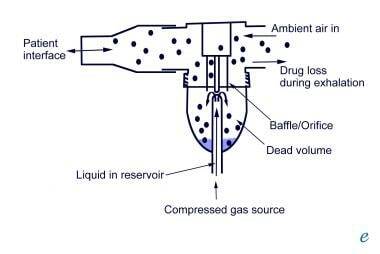 Cross-sectional diagram of metered dose inhaler (MDI). Specific information regarding different MDIs and the amount of drug per actuation for each are provided in the table below. Note: MDIs contain a pressurized propellant inside; must prime by spraying 2-3 actuations before first use or if not used for several days; shake well prior to each use; may use with or without a spacer; clean mouthpiece with water and dry. These new devices are not only more environmentally friendly but, surprisingly, are also more effective. The HFA propellant produces an aerosol with smaller particle size, resulting in improved deposition in the small airways and greater efficacy at equivalent doses compared with CFC MDIs. The United States Food and Drug Administration (FDA) published an update in April 2010 regarding the progress that the US is making with its obligations under the Montreal agreement. Seven MDIs that contain CFCs were still on the US market at that time, but they are being gradually phased out. The phase-out schedule is listed below. Alternatives to some of these medications (eg, dry powder formulations) are available. For additional information, see the FDA website. 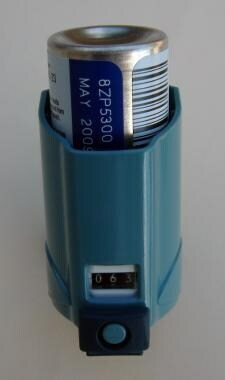 A dry powder inhaler (DPI) is a breath-actuated device that delivers the drug in the form of particles contained in a capsule or blister that is punctured prior to use. 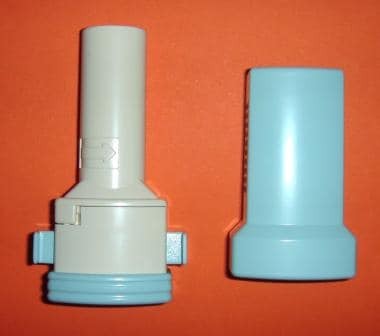 This type of inhaler requires an adequate inspiratory flow rate for drug delivery, as it does not include a propellant. Because of this inspiratory flow rate requirement, DPIs are not appropriate for treatment of acute asthma attacks. The degree of resistance to inspiratory flow required to aerosolize the medication varies with each of the multiple versions of DPIs. 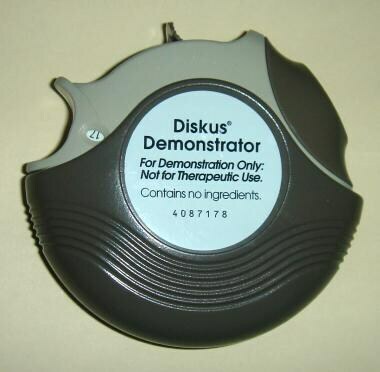 For example, the Diskus is a low-resistance device and thus is suitable for treatment of children and those with decreased lung function (forced expiratory volume in 1 sec [FEV1] < 30% predicted  ]), whereas the Turbuhaler is a high-resistance device that requires a higher inspiratory flow rate to aerosolize an equivalent drug dose. For a comparison of DPI drug delivery amounts, see Table 2 below. Note: DPIs contain dry medication inside; patient's breathing delivers medication to lungs, no propellant inside; priming not required after activating and loading initial dose; no need to shake device; do not use with spacer; keep device dry, do not place in water; clean mouthpiece and dry immediately; do not swallow capsules for inhalation. * Pulmicort Turbuhaler has been discontinued. Pulmicort Flexhaler has replaced the phased-out product. 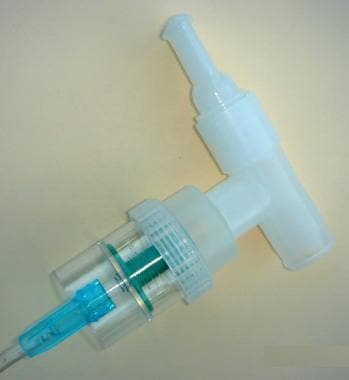 HandiHaler, depicted in the image below, is an inhalation device used to deliver the dry powder tiotropium bromide (Spiriva), a long-acting anticholinergic agent. The tiotropium capsule is placed in the center chamber of the HandiHaler, and the capsule is pierced by pressing and releasing the green button. This leads to the dispersal of tiotropium formulation into the air stream when the patient inhales through the mouthpiece. 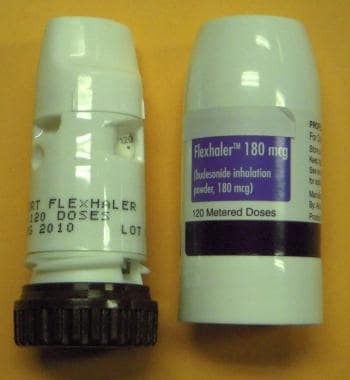 The Flexhaler, depicted below, is an inhalation device used to deliver the dry powder budesonide (Pulmicort), an anti-inflammatory synthetic corticosteroid. The Flexhaler has replaced the Turbuhaler, which is no longer marketed. The budesonide capsule is placed in the center of the chamber of the Flexhaler, and the capsule is pierced by twisting the device fully one way and then back fully the other way. 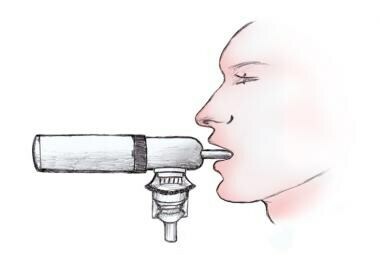 This allows the budesonide formulation to disperse into the air stream when the patient inhales rapidly and deeply through the mouthpiece. Inhalation accessory devices (IADs) generally fall into 2 categories: spacers and holding chambers. Using a spacer device with an MDI can help reduce the amount of drug that sticks to the back of the throat, improving direction and deposition of medication delivered by MDIs. 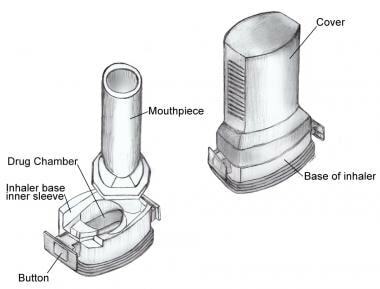 Spacers and holding chambers extend the mouthpiece of the inhaler and direct the mist of medication toward the mouth, reducing medication lost into the air. For information on features of particular spacers, see Table 3 and Table 4 below. 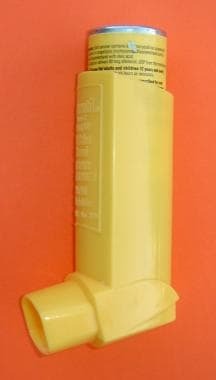 Note: These devices act as an extension of the inhaler's mouthpiece. Note: These devices direct the flow of drug from the MDI away from the mouthpiece of the spacer device. Valved holding chambers (VHCs) allow for a fine cloud of medication to stay in the spacer until the patient breathes it in through a one-way valve, drawing the dose of medicine into the lungs. 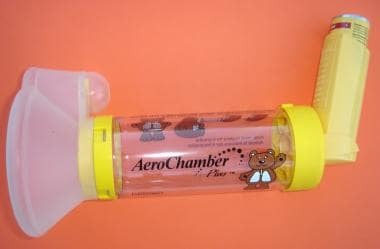 Examples include Aerochamber and Optichamber. For more information on VHC features, see Table 5 below. Note: These provide the additional feature of a one-way valve, which prevents the patient from exhaling air into the device, overcoming inhalation and actuation timing problems. 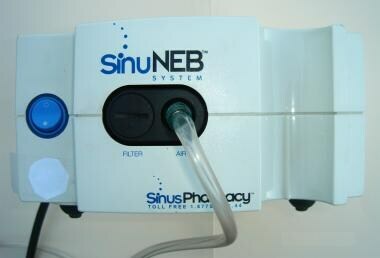 Nebulizers are devices that transform solutions or suspensions of medications into aerosols that are optimal for deposition in the lower airway. This mode of aerosol drug delivery is critical for respiratory disorders and may include corticosteroids, bronchodilators, anticholinergics, antibiotics, and mucolytic agents. Inhalation solution doses are shown in Table 6. Nebulization provides a vehicle for drug delivery to patients who are too ill or too young to use other portable inhaler devices. The 2 types of nebulizers are pneumatic jet nebulizers and ultrasonic nebulizers. Ultrasonic nebulizers may be used with all nebulized medications except Pulmicort Respules suspension (most nebulized medications are solutions). Pulmicort Respules cannot be used with nebulizer units that generate heat, as is the case with most ultrasonic nebulizers (with the exception of the Omron MicroAir). MDIs, DPIs, and nebulizers are used with the patient sitting up comfortably straight. Metered dose inhaler (MDI) positioning. 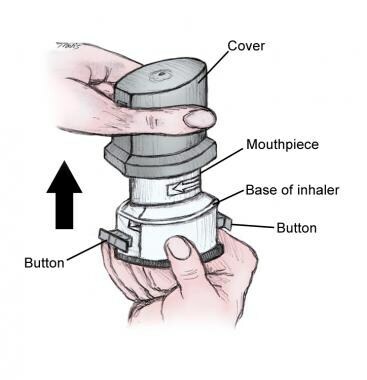 Remove the cover and hold the base of the inhaler, as shown in the image below. 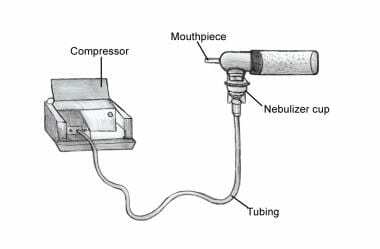 Bacterial contamination of a spacer device or nebulizer tubing and hand unit can occur. To help prevent this, these items must be periodically cleaned with detergent. Each device is unique and new devices are constantly coming onto the market. Patients must fully understand how to operate, maintain, and administer their medication. [11, 12, 26] Various patient-oriented Web sites provide good resources explaining use of inhalers. For patient education information, see the Asthma Treatment Guide. Olschewski H, Simonneau G, Galie N, et al. Inhaled iloprost for severe pulmonary hypertension. N Engl J Med. 2002 Aug 1. 347(5):322-9. [Medline]. Agertoft L, Pedersen S. Influence of spacer device on drug delivery to young children with asthma. Arch Dis Child. 1994 Sep. 71(3):217-9; discussion 219-20. [Medline]. Dolovich MB, Ahrens RC, Hess DR. Device selection and outcomes of aerosol therapy: evidence based guidelines: American College of Chest Physicians / American College of Asthma, Allergy and Immunology. Chest. 2005. 127:335. [Medline]. Adjei A, Gupta P. Inhalation delivery of therapeutic peptides and proteins. Google Book Search. Available at http://books.google.com/books?id=Env3akLfihYC&pg=PA239&lpg=PA239&dq=meter+dose+inhaler+mechanism&source=web&ots=Rw41RFP-MP&sig=PNp_Wv1IhUSvv3_Sz7Slx-pqx5c&hl=en&sa=X&oi=book_result&resnum=10&ct=result#PPA244,M1. Accessed: September 11, 2008. Newman SP, Busse WW. Evolution of dry powder inhaler design, formulation, and performance. Respir Med. 2002 May. 96(5):293-304. [Medline]. Barry PW, Robertson CF, O'Callaghan C. Optimum use of a spacer device. Arch Dis Child. 1993. 69:693-694. [Medline]. Hess DR. Nebulizers: principles and performance. 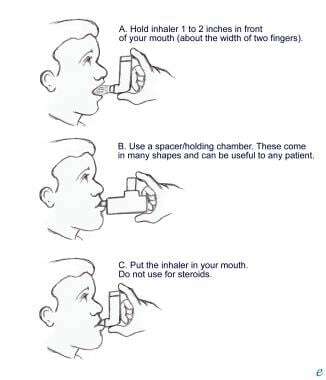 Respiratory Care. 2000. 45:609. [Medline]. Lewis D. Metered dose inhalers: actuators old and new. Expert Opin Drug Deliv. 2007. 4:235-245. [Medline]. Newman SP. 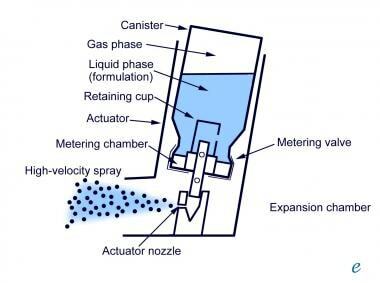 Principles of metered dose inhaler design. Respiratory Care. 2005. 50:1177. [Medline]. 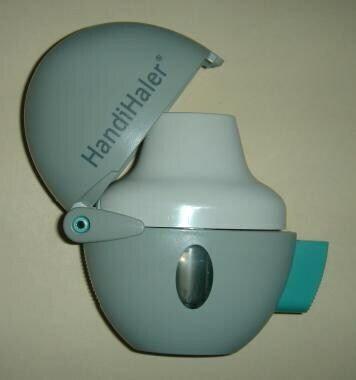 Watson P. Inhaler spacer devices to treat asthma in children. Nurs Times. 2012 Nov 13-19. 108(46):18-20. [Medline]. Reznik M, Silver EJ, Cao Y. Evaluation of MDI-spacer utilization and technique in caregivers of urban minority children with persistent asthma. J Asthma. 2014 Mar. 51 (2):149-54. [Medline]. Federman AD, Wolf MS, Sofianou A, Martynenko M, O'Connor R, Halm EA, et al. Self-management behaviors in older adults with asthma: associations with health literacy. J Am Geriatr Soc. 2014 May. 62 (5):872-9. [Medline]. National Jewish Respiratory and Research Center. The Hydrofluoroalkane Propellant. January 2008. National Jewish Health. Available at http://www.nationaljewish.org/healthinfo/medications/lung-diseases/devices/metered-dose/hfa-propellant.aspx. Accessed: March 10, 2009. Ross DL, Gabrio BJ. 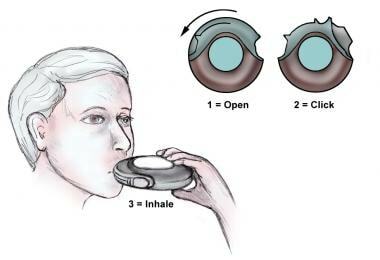 Advances in metered dose inhaler technology with the development of a chlorofluorocarbon free drug delivery system. J Aerosol Med. 1999. 12:151-160. [Medline]. US Food and Drug Administration (FDA). Phase-out of CFC metered-dose inhalers containing flunisolide, triamcinolone, metaproterenol, pirbuterol, albuterol and ipratropium, cromolyn, and nedocromil. Available at http://www.fda.gov/Drugs/DrugSafety/InformationbyDrugClass/ucm193896.htm. Accessed: April 13, 2010. Jena AB, Ho O, Goldman DP, Karaca-Mandic P. The Impact of the US Food and Drug Administration Chlorofluorocarbon Ban on Out-of-pocket Costs and Use of Albuterol Inhalers Among Individuals With Asthma. JAMA Intern Med. 2015 Jul. 175 (7):1171-9. [Medline]. Kamps AW, Brand PL, Roorda RJ. Variation of peak inspiratory flow through dry powder inhalers in children with stable and unstable asthma. Pediatr Pulmonol. 37. 2004:65. [Medline]. Nielsen KG, Auk IL, Bojsen K, Ifversen M, Klug B, Bisgaard H. Clinical effect of Diskus dry-powder inhaler at low and high inspiratory flow-rates in asthmatic children. Eur Respir J. 1998 Feb. 11(2):350-4. [Medline]. Ram FS, Wright J, Brocklebank D, White JE. Systematic review of clinical effectiveness of pressurised metered dose inhalers versus other hand held devices for delivering beta 2 agonists bronchodilators in asthma. British Medical Journal. 2001. 323:901. [Medline]. Formoterol fumarate (Foradil) [package insert]. Kenilworth, NJ: Schering Corporation. Sep 2006. Available at [Full Text]. Panning C, DeBisschop M. Tiotropium: An inhaled long acting anticholinergic drug for Chronic Obstructive Pulmonary Disease. Pharmacotherapy. 2003. 23(2):183-9. [Medline]. [Full Text]. Rodriguez-Martinez CE, Sossa-Briceño MP, Castro-Rodriguez JA. Comparison of the bronchodilating effects of albuterol delivered by valved vs. non-valved spacers in pediatric asthma. Pediatr Allergy Immunol. 2012 Nov. 23(7):629-35. [Medline]. Esposito-Festen J, Ijsselstijn H, Hop W, van Vliet F, de Jongste J, Tiddens H. Aerosol therapy by pressured metered-dose inhaler-spacer in sleeping young children: to do or not to do?. Chest. 2006 Aug. 130(2):487-92. [Medline]. Hess DR. Aerosol delivery devices in the treatment of Asthma. Respiratory Care. 6. 53:699-723. [Medline]. [Full Text]. Reznik M, Jaramillo Y, Wylie-Rosett J. Demonstrating and assessing metered-dose inhaler-spacer technique: pediatric care providers' self-reported practices and perceived barriers. Clin Pediatr (Phila). 2014 Mar. 53 (3):270-6. [Medline]. The authors and editors of eMedicine gratefully acknowledge the contributions of Shankar Buddiga for photography of aerosol delivery devices, Nathan R Hollman, Doctor of Pharmacy Candidate, for creating the tables summarizing the various devices, and Pari Respiratory Equipment, Inc, for reference material regarding nebulizers and pediatric masks.